Well another year is over, and I can’t even remember exactly where it went. Here is my review of 2008, the year that was. One of the best decisions I have ever made was to adopt these two beautiful kittens. They come from different litters, but act like brother and sister. They have brought me a lot of ups, as well as some downs – when I brought them home after being desexed, Moko ripped her stiches out within 5 minutes and blood (and what I thought may have been guts) were coming out everywhere. After an emergency trip back to the vet we got her stitched up again. Despite the wound being restiched, she was still dripping blood all over the floor and wouldn’t stay still. It was an extremely stressful time for me, and made me realise how important they are to me. It was also on this day that we found out that Zahra (previously known as Tinkerbell) was actually a boy. Due to her fluffyness the vets hadn’t picked up on it earlier, and it was only when they went to cut him open that they noticed. We now refer to Zahra as just Za – but we lived with him for 3 months thinking he was a she, so we still often get it mixed up. 2008 was also the year that I switched to working fulltime on my business “Mojito Solutions”. Overall it has been a good first year – we haven’t quite made as much profit as I would like, but this is mainly due to spending more on expenses then I expected. 2009 is looking very promising – we are booked out for January and February, and have a bunch of new potential projects lined up as well. To help cope with all the work, I put on a staff member at the end of November part-time, and have now offered her a full-time position starting January. 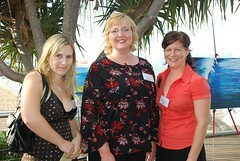 I was also lucky enough to secure a position on the Townsville Business Women’s Network (TBWN) Committee as Web Developer to code and launch their new website, which went live in May 2008. The network consists of about 400 local business women who get together once a month for a luncheon, or cocktail party. I have met some absolutely amazing people through this group and highly recommend any other business women to get involved. Sick of spending all day inside in front of the computer, in May I decided to start up a vegie garden. I was currently looking after my parents house while they were on vacation so anything that I set up had to be portable so I can take it with me when I get my own house next year. Here are the pictures from the initial setup, and then again 21 days later. I have since switched to growing most things straight from the seeds, but the hot temperatures and large rainfalls have affected the garden in the last month, and currently there’s not much left. In September I travelled down to Sydney for my annual trip. It was a busy 10 days consisting of catching up with my little sister, and attending the OZ-IA and Flying Solo conferences. Oh and lots of shopping. Was a great trip as usual, but not sure if I will be able to do it again next year due to finances and workload. One of the many benefits of being self-employed is that you can be flexible with the hours you work. I have been able to spend some quality time out on the boat fishing with my Dad. Probably attributed to the looking after the kittens, but I feel somewhat more responsible and capable of looking after things now. I have changed my attitude to see the positive side of everything, instead of all the bad things and this made more of a difference then I could have imagined. I recommend reading The Art of Happiness, by the Dalai Lama for people looking to opening their mind up to looking at the world more positively. I would also like to thank all the positive people that surround me. I have been quite lucky to be surrounded by supportive, positive people who have helped me grow and continue to support me every day and I am very thankful for everything they have done. We ended up postponing this. While it is still something I would very much like to do, there are other things I want to do more and I don’t have the money (yet). For now I am postponing this goal to 2010 when I am (hopefully) more financially stable. To be honest – I don’t think I worked on this at all this year. It kept getting put off as the importance became less and less relevant. Still not sure if it will ever get finished, and im ok with that. Well there’s some money in the bank – but only about $2K which I think is what I may have had at the beginning of the year. Switching to being self-employed has meant that income hasn’t been steady, which has made it super hard to make regular contributions. Think I got it to about 5K at one point, but then had to withdraw money to pay credit card (which I ALWAYS payoff monthly). So based on this, I didn’t really achieve any of my goals, but I still feel that I had a really good year. I got to spend it with my beautiful boyfriend and gorgeous kittens, doing what I love (making websites and helping people) and there wasn’t too many downs. This is what I want more than anything right now. I am keen to get active and get my hands dirty and do some renovating, but need to save up a deposit first. Ideally I would like to achieve this before June 30 so that I can get the first home buyers grant, but if I end up doing this by myself, and am not eligible for a normal home loan (due to being self employed) then I’m looking at minimum deposit of $60,000 for a $300,000 loan. I really enjoy blogging, but never seem to find the time to do it. This will hopefully change in the new year by restructuring other parts of my life to be more balanced. Ideally I am going to aim for once a week. Let’s see how we go. I enjoy cooking, but once again can never seem to find the time or sometimes energy to do it. Because of my current living situation, it’s very easy to get away with not cooking. This year I have allocated two nights where I will cook (Mondays and Wednesdays) and I am also going to try and make one of those nights a “new recipe” night, where we try something new. 52 new meals – how hard can it be. I loved reading as a kid and would often read about 5 books a week (a little extreme I know). The last couple of years I have been reading more often, but it comes and goes. This year I am aiming to read 25 books (includes fiction and non-fiction). No new years goal list would be complete without some mention of health/weight/fitness. This year my health goal is to get back to 56kgs which is what I was about 3 years ago. I was at about 61 before Christmas so hopefully it shouldn’t be too hard to achieve. While I wouldn’t call myself overweight I would like to be a bit healthier, stronger and more toned which hopefully this will help achieve. I am setting myself a maximum of 10 hours to work a day, as well as scheduling in 3 day mini-breaks every 3 months to help cut down on the amount of hours I find myself working. While I love what I do, sometimes it does feel like it is all I do and I don’t want to start not enjoying it.